As a homeowner, your needs do not remain constant and you will inevitably find yourself in a position where your existing space no longer meets your requirements. Maybe your family has outgrown your home, or you need less space as the kids head to college and move out, or perhaps work changes mean you need to consider a new location; various factors can push you to make a change. We look at the reasons why homeowners move and if moving isn’t an option, why homeowners choose to renovate. This graphic was created using data from the Characteristics of Recent Home Buyers report published by NAHB this February, which was based on the most recent American Housing Survey, looking at people that bought a home in the two years prior to the survey’s release. This graphic shows two buyer types: First-time buyers (FTBs) and trade-up buyers (TUBs), and as can be seen, these two groups are prioritizing reasons for buying, differently. The two buyer groups have also been combined, to show averages for all buyers. The most popular reason to move for both groups was for a better home (1st) but with 65% of first-time buyers and only 49% of trade-up buyers choosing this option. The second most popular reason to buy overall was to move to a better neighborhood (2nd), this reason was most popular with 49% of TUBs while 45% of FTBs chose this option. The second most important reason for FTBs to buy was to form a household (3rd) with 61% choosing this option, while only 25%TUBs chose this as a reason. Moving closer to the family (4th) was almost equally popular, with 23% TUB’s citing this as a reason to buy and only 20% FTB’s. Reducing household costs (5th) came next with 18% TUBs and 19% FTBs claiming this was a reason to move. A change in the household (6th) almost matched household costs, with 17% TUBs and 19% FTBs choosing this reason to move. Moving for a job (7th) only instigated a move for 16% TUBs and 12% FTBs. Reducing a commute (8th) was even less important with only 11% TUBs and 13% FTBs giving this as a reason to move. Being forced to move (9th) clearly was not a common situation, coming in last with only 3% of buyers claiming this as a reason to move. Other reasons(10th) caused 19% of TUBs and 13% of FTBs to move. 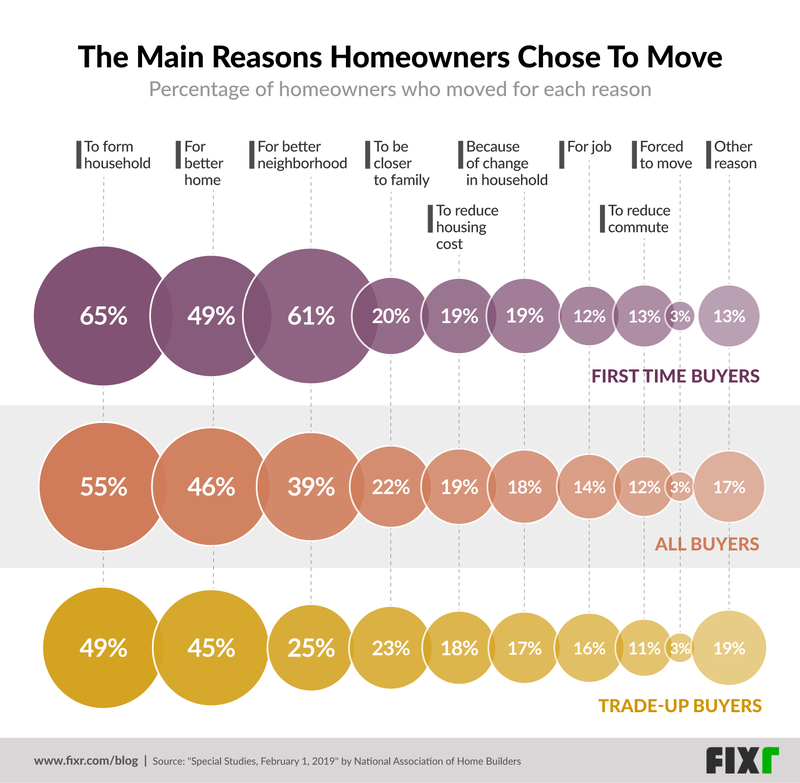 The most popular reasons to move seem to be caused by internal factors and personal choice; the choice of moving to a better home is the biggest reason for first-home buyers to get motivated for moving. While the least popular reasons seemed to stem from external influences, specifically relating to work. After researching homeowner’s reasons for moving, we also took a look at data on the most popular reasons for remodeling. This graphic shows data from the NAHBs 2018, first quarter survey of NAHB members who are remodelers in the industry. 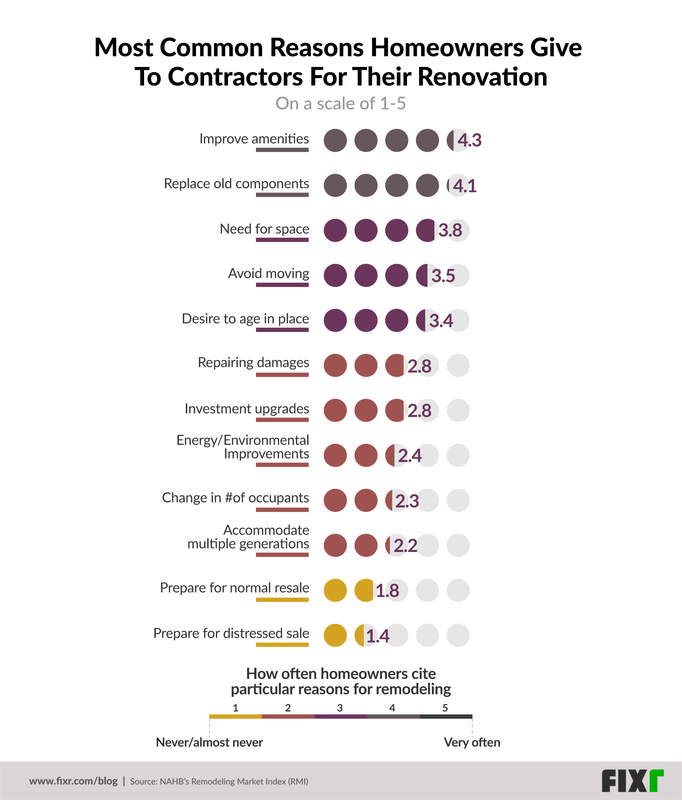 These contractors were asked to rate the most common 12 reasons homeowners chose to remodel. The survey was set on a scale from 1 to 5 where 1 represents never and 5 very often. Wanting to improve amenities (1st) topped the list with a rating of 4.3, meaning homeowners cited this as the reason for their remodeling job most often. It was closely followed with a need to replace old components (2nd) which had a rating of 4.1. The next most common reason only scored a 3.8 and represented the homeowners need for more space (3rd) in their home, which is closely linked to wanting to avoid moving (4th) which had a score of 3.5. Being able to age in place (5th) is the reason that has seen the most growth in the last few years, from 32% in 2012 to a high of 52% represented by a rank of 3.4 during this survey. The next options started to head to the half-way mark, with both repairing damages (6th) and increasing the investment value (7th) of the home getting a score of 2.8. Dropping below the halfway mark was environmental and energy efficiency (8th) with a 2.4 rating, change in household residents (9th) with 2.3 and accommodating various generations (10th) in the home with a score of 2.2. The bottom 2 reasons for homeowners to renovate were preparing for resale, with preparing a property for an ordinary sale (11th) getting a 1.8 score and preparing for a distressed sale(12th) getting the lowest ranking of 1.4. While both graphics provide valuable insight for homeowners and contractors alike, it's in comparing the datasets, that we can truly get an understanding of the market. 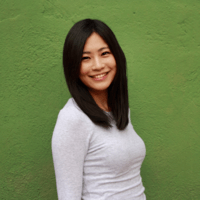 The reasons that topped both surveys are closely linked. Homeowners who chose to stay in their homes (stayers) would remodel most often due to wanting to improve the amenities in their home or replace old components, while it can be argued the 55% of the homeowners surveyed that had chosen to buy a new home (buyers), may have done so to achieve similar improvements. Family also plays an important role for homeowners, however, buying a new home to suit changed circumstances seemed more popular overall. 3rd, 4th and 6th place were all linked to a move motivated by family and household members for those choosing to buy a new home. While choosing to remodel to adapt for family or household member only held 9th and 10th positions, for the stayers. Interestingly, needing more space wasn’t one of the specific reasons stated for homeowners choosing to buy a new home, while it was 3rd most important in terms of reasons that stayers chose to remodel. While this could have been included in the idea of ‘a better home’ which took top place for buyers, stayers may be staying for other reasons, for instance, loving their neighborhood, or having children in a local school, which leads to them choosing to renovate, to get that extra space. Geographic factors tend to be caused by external forces, generally work-related, and don’t give much choice to those who would prefer to have stayed in their existing home. For instance, moving for a job dictates that homeowners fall into the buyer's category, irrespective of their preference (Though this represents only 14% of home buyers). Changes in the job market could force/encourage homeowners to move, depending on which states are developing and offering more/better jobs. According to a Kiplinger survey, Oregon, North Carolina and Florida top the list for fastest growing job markets, though this may be more relevant for gen Z’ers and Millenials, looking to make their first purchase. Older homeowners closer to retirement may not be as affected by these forces, and as always data should not be considered in isolation. A voluntary move such as moving closer to the family would be a more personal decision, and generally outside of market forces. Given the slow in the property sales market, choosing to remodel rather than move has been the focus for homeowners for the last few years. However, even remodeling is beginning to waver as the housing market continues to slow thanks to what may be stagnation of the housing sales market. Ultimately, choosing to stay and improve your existing house or move to a better one is based on priorities, budget, and availability (if staying, labor and materials, if moving, available houses for sale). Homeowners will need to consider both options carefully if a change is needed. Would remodeling sufficiently add to the overall value of the home either for resale or for staying on indefinitely, or, if moving, are the houses available really going to provide the solutions to the forces driving the move? Contractors should be able to provide insight as well as quotes to help homeowners to educate themselves on their options. At the end of the day, both parties should follow the moves in the market for homeowners to take advantage of positive changes and contractors to provide services that are in demand.